Braces are Far More Attractive Than Crooked Teeth - URL from AAO on Vimeo. Traditional metal braces are still the most common type of braces and are smaller and more comfortable today than ever before. Made of high-grade stainless steel, metal braces straighten your teeth using metal brackets and arch-wires. 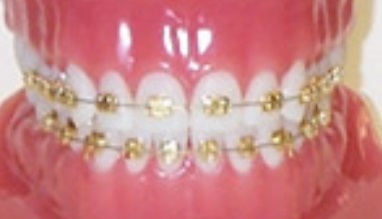 With metal braces, you have the option of adding coloured elastics (rubber bands) for a more unique and colourful smile. Ceramic braces are made of clear materials and are therefore less visible on your teeth than metal braces. For this reason, ceramic braces are used mainly on older teenagers and adult patients who have cosmetic concerns. While they are visually less prominent, they do require more attention to oral hygiene as ceramic braces are larger and are more brittle than their metal counterparts. For these reasons, ceramic braces tend to be used more on upper front teeth than on lower teeth and are slightly more expensive. Invisalign® uses a series of invisible and removable aligners to straighten your teeth. And, no one can tell you are wearing Invisalign because it's almost invisible! Then because the aligners are removable you can eat and drink what you want while in treatment, plus brushing and flossing is easier. The aligners are quite comfortable and have no metal to cause mouth abrasions during treatment. There are many different appliances that may be used with braces or before braces to align teeth and jaws. Some are glued to the teeth and some are removable.